It’s not hard to imagine Leith Moore sea kayaking in the Arctic. 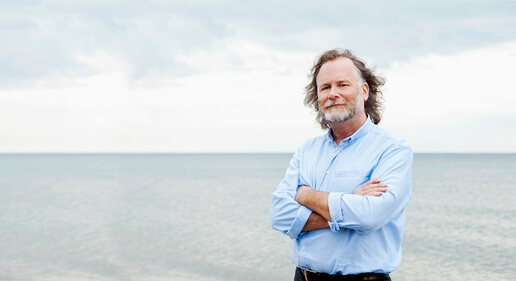 Long, wild hair and a beard that wouldn’t look out of place on a mountain climber several weeks into a difficult ascent are the first things you notice about him. 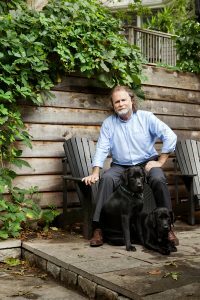 But today his sharp, crisp, collared shirt is casually unbuttoned at the top and his possibly designer jeans are not out of place in the business-casual setting of the Sorbara Group’s corporate offices. However, on further inspection, his bare feet in what can only be described as half-shoes-half-sandals give me a little insight into OHBA’s incoming president. When he greets me for our scheduled interview at the Sorbara offices in Vaughan, the first thing that gives him away as a successful businessman is the BlackBerry attached to his hand. I extend my right hand to introduce myself, and he immediately reaches back to acknowledge my offering, but before our hands meet he hesitates realizing the smartphone is still firmly planted in his palm. “Don’t touch my BlackBerry,” he deadpans. As we make our way back towards his corner office, he’s stopped by an employee. The brief exchange reveals a boss who’s both approachable and obviously well-respected — and one who returns that respect, which becomes more apparent as we begin the interview. He found himself managing a wide range of departments including construction, sales and marketing, approvals and acquisitions. “It just seems like every five years the company grew and we did a little more, so my role changed a little bit. It hardly seems like it’s been five minutes because things have changed so much over the years.” But that five minutes actually translates into over 30 successful years with Sorbara. During a high school class, a visit from the town planner in Nepean — the place where he grew up and still lovingly refers to as home — sparked Leith’s interest in the subject, so he applied to one of the only universities offering a speciality in urban planning. Leith seems to be naturally drawn into leadership roles — and doesn’t take the importance of these roles lightly. Whether it’s his teaching posting at his alma mater, his strong sense of duty to the next generation of builders and developers or his top roles at the associations, Leith is never short of enthusiasm for the task at hand; it may be a laid-back kind of enthusiasm, but you only have to talk to him for a few minutes to realize his passion for every aspect of the industry. He also stresses that even though he’s a GTA builder/developer with strong ties to the local association, his interest is province-wide. “I’m really excited about having the chance to build on what I’ve learned as the chair of BILD and to take some of those projects that we got somewhat done and try to move them further along,” he says. Leith’s term as president also highlights something larger going on at the association. In the past, presidents have come in with a singular focus — something that really draws on their own interests or strengths. However, each year the foundation that has been built the previous year, in some sense, falls to the wayside. However, Leith is actually part of a three-year action plan presented by Joe Vaccaro, chief operating officer at OHBA, and supported by the OHBA board and other members of the executive. A large part of stepping forward is not to lose the momentum gained during the previous step — in this case, Tarry, as past president, will still be intimately involved in the association and will continue to grow the relationships he’s cultivated over the last year. Leith likens this scenario to having a prime minister with a cabinet, rather than simply having a single president — “People need help,” he says. Besides building on last year’s momentum, Leith says he also wants to focus on a number of areas, specifically increased communication with members and government. This year will also see a number of major issues coming back around, including the review of both the Growth Plan and the Condo Act. A few days after our shop talk in the corner office, I meet up with Leith at his comfortable home in the Beaches of east-end Toronto. We’re there to photograph Leith for his presidential cover, but I’m also there to get a real glimpse into the world of Leith Moore outside of the silk-panelled office. And there’s no better place to do that than his beloved cottage by the water. He landed in the Beaches, a unique stretch of houses and shops along Queen St. E. in Toronto’s east end, in the mid-1980s and has resided in his current home for over 15 years. It started as a small cottage, and through a number of renovations, including some extensions to the original layout, it’s now a small renovated cottage. What should be the front lawn is actually a walkway surrounded by a wild, but well-maintained, garden. And that feeling — organized chaos, might be a fair description — extends throughout his home, and, I would have to guess, probably into Leith’s entire philosophy on life. Once inside, after being greeted by his two beloved one-year-old black labs, the first thing you notice is the lack of empty space. Every inch of the walls are covered in plaqued photographs — from a kilted Leith on the day he married his wife Melanie (in their backyard) to him proudly bundled up in the Arctic. The living room area is floor-to-ceiling bookshelves stacked with books. And in what is probably the understatement of the year, Leith casually says, “I read. A lot.” Paintings, with an obvious nature theme, are casually but purposefully hung on any wall not covered in books. The kitchen has a renovated feel — modern and tasteful with all the details you’d expect from a successful builder. 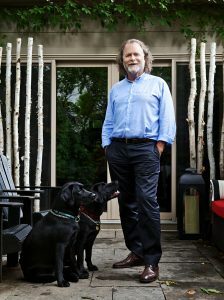 And his office, an addition on the back of the house, which looks out into his small Muskoka-like backyard, contains various trinkets from his travels, more books and more plaqued photographs. Almost as an afterthought, there’s a computer and some paperwork on a desk. As we wrap up the photo shoot — and Leith passes out invitations to his jazz festival party — I feel like even in few short hours we’ve spent together I have a pretty good idea of the type of person, and the type of leader, Leith is: What you see is what you get. He wears his passion on his sleeve and it’s that passion that guides every aspect of his life. And that passion will serve him well in his new position as president. 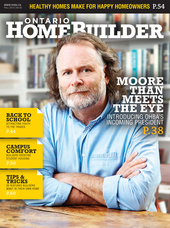 To purchase a copy of Ontario Home Builder – Fall 2012, click here. To view the full digital version, log in and then click here.